Turkey bacon and pork bacon are both viable options for breakfast meats and both can be used in a variety of dishes. Pork bacon is the traditional option, with the turkey version being the more modern imitation of it. Choosing between the two – especially for BBQ purposes – will involve considering a range of factors, the most important of which we will consider below in another Fiery Flavors BBQ Showdown. How do turkey bacon and pork bacon differ? The big difference between turkey bacon and pork bacon has to do, obviously, with their respective sources. Turkey bacon is the cured and smoked meat from a turkey and the other the cured and smoked meat from a pig. The other significant difference has to do with their perceived health benefits and drawbacks. Turkey bacon is widely considered to be the healthier of the two options. 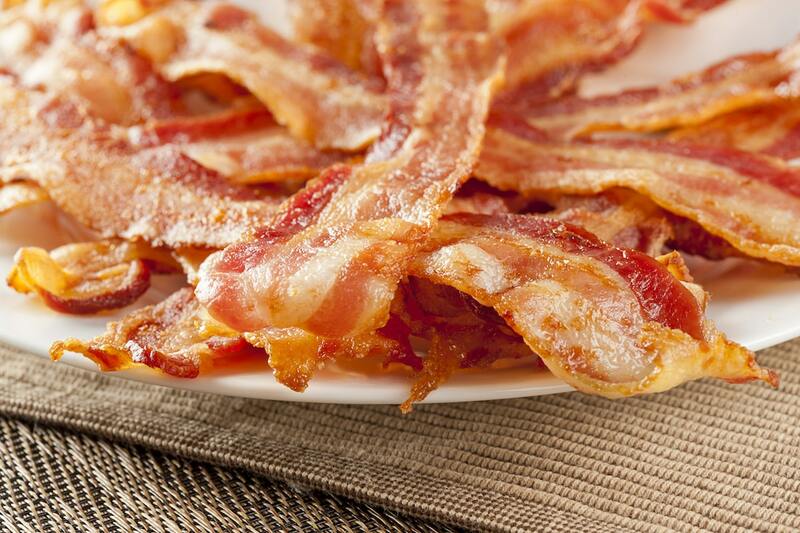 Many people believe it to have much less fat and sodium when compared to pork bacon. While turkey bacon does have lower levels of unhealthy fats, it also has higher sodium. All things considered, there is little difference between the two in terms of actual health benefits. Because turkey bacon is lower in fat than pork bacon, it has less flavor and is chewier. Because of the muted flavor, turkey bacon is not a good substitute for pork bacon in dishes where pork bacon is used to provide flavor. Because it does not get as crisp, it is not good for providing a bacon-like texture either. Is it easier to smoke one than the other? While there is little difference between cooking prepared turkey bacon and pork bacon, the process of making turkey bacon from scratch is much more complicated than the one for making pork bacon from scratch. To make pork bacon, you start with a piece of pork belly that you will cure using curing salt. After that initial step, you should smoke your pork belly. Once your pork belly comes out of the smoker, it is officially bacon. You can slice it into strips and fry it. With turkey bacon, you will need to complete a few additional steps. First, you will want to use only the thighs of the bird. No other part of the turkey will provide you with enough meat and enough fat to reasonably replicate bacon. After curing and smoking your turkey thighs, you will remove the meat from the bone and grind it. You must then place the ground meat on sheets of plastic wrap and form it into a log. Compress and flatten your log and then chill it. You can then slice the chilled log to get an approximation of pork bacon. Turkey bacon is generally much less expensive when compared to pork bacon. In some cases, turkey bacon sells for around half the cost of an equivalent amount of pork bacon. Note that turkey bacon is most commonly sold in 12-ounce packages, while pork bacon is usually sold in 16-ounce packages. When should you use turkey bacon and when should you use pork bacon? Use turkey bacon in cases where the need to have a healthy dish exceeds the need to have a true bacon flavor and texture. In fact, you should avoid drawing attention to its shortcomings by not using it as a bacon substitute at all for most traditional barbecue meals. Use pork bacon in dishes where its rich flavor and fattiness will be an asset. It is the best option in cases where its flavor and texture are key to the success of the dish. You’ll notice the difference in richly flavored barbecue recipes.